Today, we ate a quick breakfast at the Jerusalem Hotel before we headed out for site tours. First we went to Oasis 500, a newly formed Jordanian early stage incubator and fund. 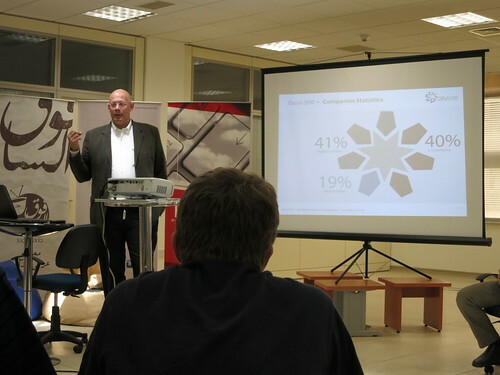 We have learned much about the VC ecosystem in Israel through our meetings with Ed Mlavsky at Gemini Israel Funds, Eran Feldhay at Misgav Venture Accelerator and Jon Medved over the past two weeks. In Jordan, there is no ecosystem. Today, we ate a quick breakfast at the Jerusalem Hotel before we headed out for site tours. First we went to the headquarters of Oasis 500, a newly formed Jordanian incubator and early stage fund. We have learned much about the VC ecosystem in Israel through our meetings with Jon Medved, Ed Mlavsky at Gemini Israel Funds and Eran Feldhay at Misgav Venture Accelerator, over the past two weeks. In Jordan, there is no ecosystem. Simply, investors in the region are risk adverse and shy away from early stage companies. This creates a financial "desert" where it is hard to find capital unless a company is prominent. 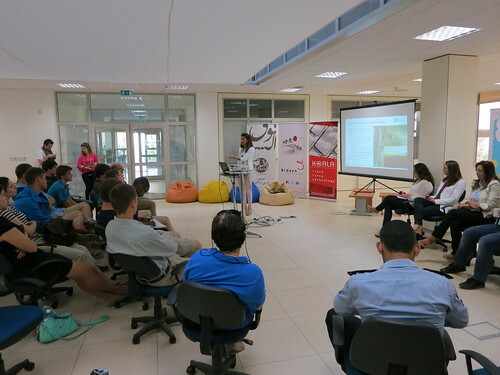 Misgav Ventures and many other incubators were started by the Israeli's in 1990s to counter an influx of educated scientists from former-soviet states that could not find jobs or capital. In the same way, Jordan is aiming to jumpstart their ecosystem through government encouragement. Like at SESAME, King Abdullah II and his Fund for Economic Development had a direct hand in shaping and funding Oasis. The vision to counter the "desert" is to fund 500 companies in 5 years (hence the name Oasis 500). First, Investment Manager, Salwa Katkhuda, gave us an overview of Oasis 500 and the results that they have produced in the past year. Roughly, the program takes an idea and moves it towards realization through a 6 day bootcamp, 100 day guidance and JD 22,000 initial funding. Oasis 500 has set its focus on information and communications technology (ICT) business models because they easily scale up and the initial capital needed is far less than many other markets. Currently, they are outpacing estimates that would allow for the 500 companies target. Next, local entrepreneurs presented their business models and what part of the Oasis programs was most beneficial. Most of the business models took ideas from things that already exist in the US and catered them for an audience in the Middle East. Last, Executive Chairman, Usama Fayyad, took any remaining questions that we had unanswered. He also talked about why he returned to Jordan after working in the US at Yahoo. During the questions, a man from a prominent VC fund in the Silicon Valley introduced himself and also asked some questions. It seems clear to me that Oasis is making an impact if people in Silicon Valley are interested in the fund. 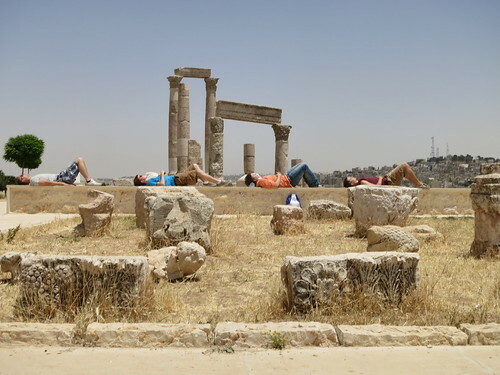 We traveled, from the Oasis 500 headquarters, to Jabal al-Qal'a, a historic site in the middle of Amman. We toured the Temple of Hercules and the Umayyad palace. Like in Jerusalem, many sites have been built on top of one another. For example, the Crusaders built on the previous Roman site built on the Umayyad palace. Excavation has show that Umayyad palace itself was the site of a Byzantine Church and Ammonite city. Next we made a stop at Friends of the Earth Middle East (FoEME), an environmental justice organization that works in Israel, Jordan and Palestine. We listened to a presentation on the general work of FoEME and specific projects. One of those projects, Rehabilition of the Jordan River, brought together mayors from both sides of the border to work on water conservation and increasing biodiversity. Chairman and Jordain Director, Munqeth Mehyar, also fielded questions from our group about the struggles of working in a complex political environment. After the meeting, we returned to Taween Al Hawa for lunch. Tonight, we drove, from lunch, for three hours, to Petra. We are staying in the Oscar Hotel. Unlike, some of the sites we have seen, rather than demolishing buildings and starting a new site, most of the remains at Jabal al-Qal'a were a mixture of architectural styles. In the same way, Oasis 500 and FoEME combine ideas that exist elsewhere to make something special.